‘Hope for future, Hard work and challaging attitude make me an able person in the community, I am not worrying for the basic needs , people love me because I amnot only running the businnes but also fulfiling their requirments at the door step I am serving them. I am greatful to BDVS for helping me to start a right job in right time in my own community’. Says Narasingha Manjhi aged 26 of Sakshohara. NarasinghaManj was worried for his own needs and his families basic need. He had tough time running his family. As a daily wage labour he got two to three days work in a week. With his low income it was very difficult to run the family and meet the educational needs of his children and all other needs of wife and elderly parents. In this difficult situation he met community animator of BDVS, who helped him to get support from BDVS. Through animator’s continuous visit and good motivation, Narasingha joined the youth group formed by BDVS. 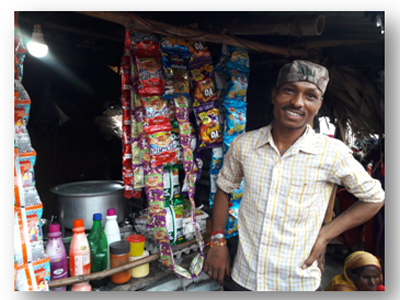 By seeing his condition the youth group assisted him Rs 6000/ to start petty business with fast food center in his community. Slowly people started buying things from his shop they also liked the taste of the fast food and his business grew. Now he has made a wooden stall and he earns Rs 500/ to Rs 700/ per day. This was a great support for him to look after his children and family. “I am so grateful for the help and support given by the BDVS and the youth group” says Narasingha.